(Notice) Umeda Hagakure quit their business on September 25th, 2018. The second day of the trip. Our hotel prepared light breakfast (small bread, boiled egg, orange juice, coffee and so on) for us at small cafeteria. But we didn’t eat them except orange juice. A, our hotel was it. “Business Hotel Nissei”. There’re much foreign tourists because it is close to Namba station and it cost us cheaper. Why didn’t we had breakfast at the hotel though breakfast was included ? The reason is that. This udon shop !!! Umeda Hagakure . It is on the under ground of Umeda station building. I didn’t know about the shop, but I followed him without thinking. Just I follow him, he takes me to good restaurants. The chef warmly welcomed us and the shop was full when we were taken the order. Wow ! After a while, such a plate was put on the counter above our table. Raw egg, sesami and green onions. Well,,,, Every toppings and pure soy sauce was put on the udon !! Wooow ! Beautiful !!! End he mixed them altogether. He gave us perfect service 🙂 I kept quiet and waited like child. Finished !And he said to me, “Hold two with chopsticks and eat”. I did as he said. The udon was smooth and springy. I hadn’t eaten such a udon ever. Is that udon ? What is udon that I had ever eaten. Quite different from udon that I had ever eaten ! He ordered this. Cold Kijyoyu udon (生じょうゆ, 600 yen). It was also great. Grated daikon radish, green onion and sudachi. Sharp flavor of Citrus sudachi was good ! 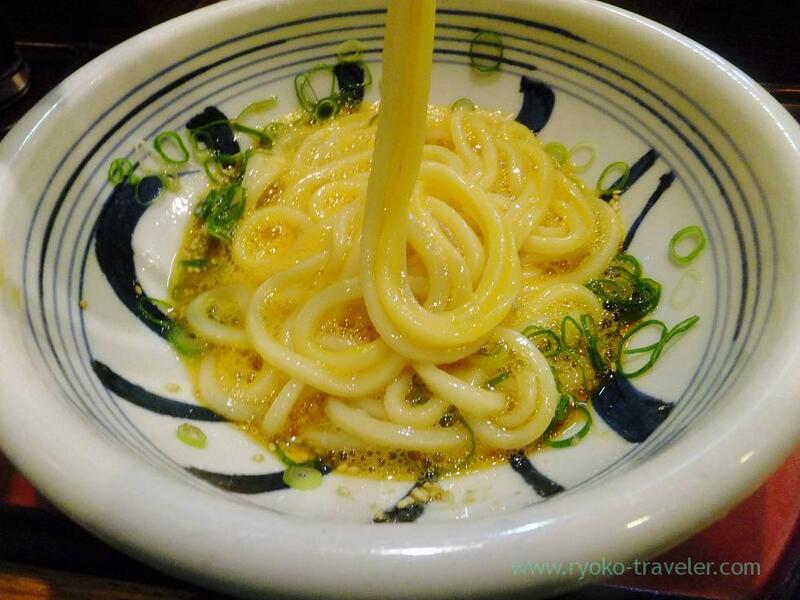 AH, I want to eat the udon again very much. Now !